During my electronics overhaul, it was a priority of mine to get my headlights working reliably. You maybe thinking ‘if this guy can’t even get his headlights working reliably, he’s got no hope’, however I’ll point out that they are retrofitted HID Xenon bulbs with a ballast kit. For this reason, it’s not just as simple as getting 12v to the connector and passing it through a halogen bulb which will simply light up proportionally to the voltage (or lack thereof). The 12v firstly goes through a ballast box which transforms it into 15000v to fire up the Xenon bulbs. The voltage and current therefore need to be substantial enough to fire up the boxes each and every time. The main issue for me was the wiring next to the wing, underneath the bonnet, which has corroded in nearly every area it could have! You can see the rusted connections, dodgy wiring and the general sad state of the loom. By the time the voltage had reached the plastic H4 connector it was at 10.6v, lost partly through the poor connections you can see above. I rewired the entire loom for the headlights, indicators and sidelights with crimp connectors pre-manufactured with heat shrink in the hope they will stop any corrosion in the future. I used these connectors extensively in my fusebox rewire and they are available at a very good price on eBay. I also used a new H4 connector with clean terminals which would hopefully make the best connection possible to the ballast box. Indeed, at this point the voltage was up to 12.5v which is far more conducive to a reliable system. I plugged the ballast back in to test it out and whilst it was noticeably more reliable, the headlights had a tendency to fail if the engine wasn’t on and providing a bit more oomph than just the battery current. Something else had to be done! 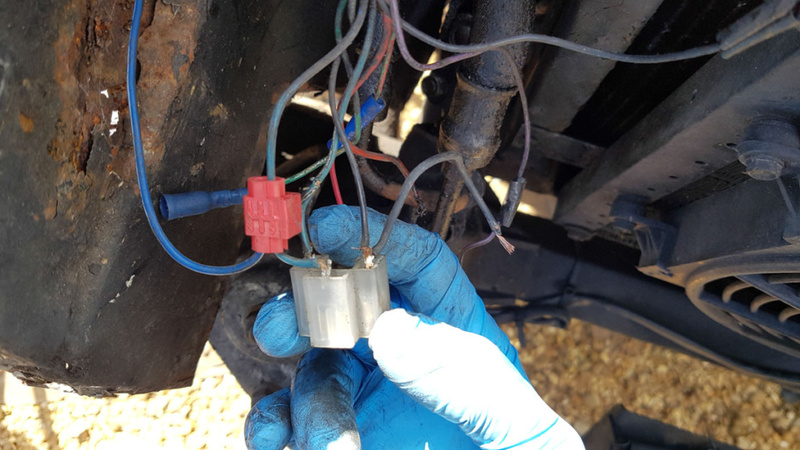 If you don’t have the wiring diagram for the Fairway, you can check it out on my Parts & Documents page (it’s at the back of the workshop manual). When you have a look at the section for the headlights (or check out the handy diagram below), you’ll notice the complexity of the circuitry which revolves around switching the voltage through a dim-dip relay. 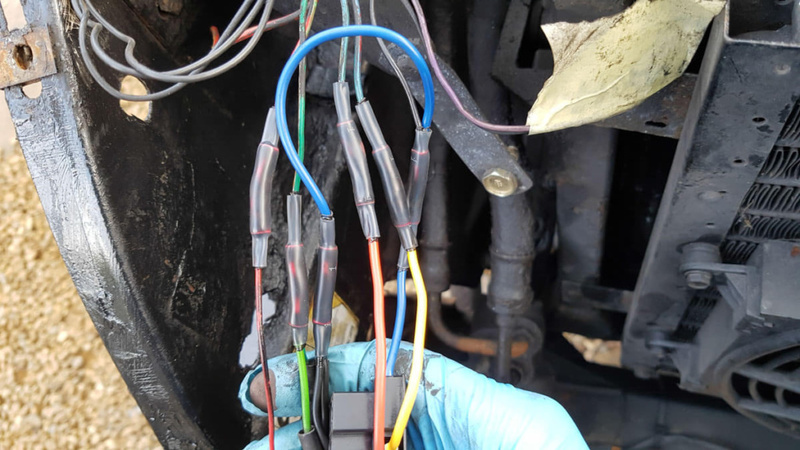 In reality, this adds about 3m extra wiring and many connections behind the dash as the 12v is sent from the switch on the steering coloumn, to the relay on the passenger side, then back to the fuse box and only then onto the lights. 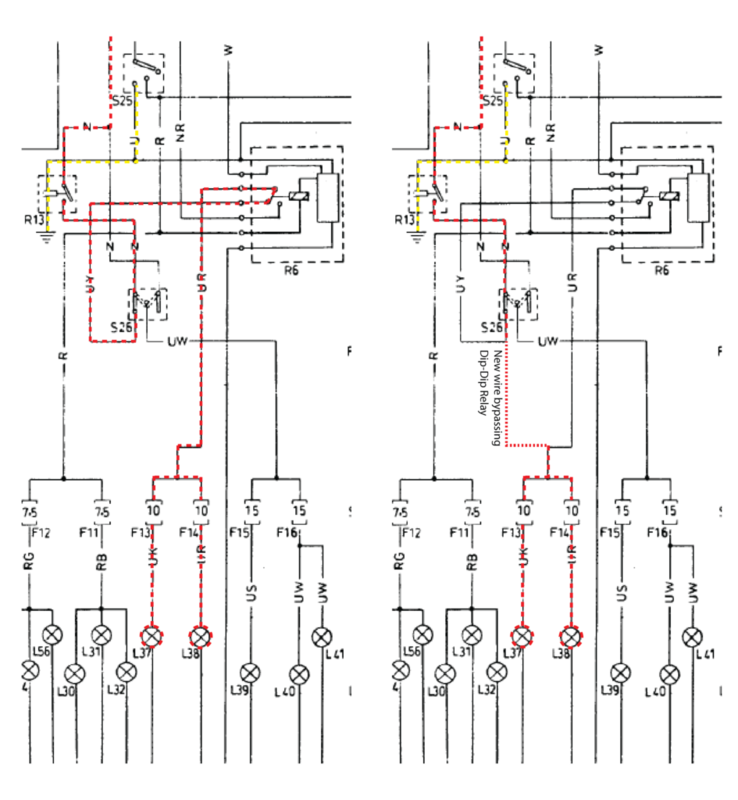 On the left of the above image, you can see the long path and the large amount of connections the 12v has to go through before it reaches the light (or ballast in this case). It’s no wonder it is all but vanished by the time it gets there! The dim-dip relay is of no use now I have removed the original halogens, as it just sends current which has been through a resistor to the headlights when the sidelights are switched on and wouldn’t fire up the ballast in any event. For that reason, I cut the dim-dip relay out of the circuit completely and sent the 12v from the indicator stalk on the steering coloumn, directly to the back of the fusebox then onto the ballast. This cut out a hefty amount of rotten wire and corroded connections and meant the ballast boxes were finally working reliably!